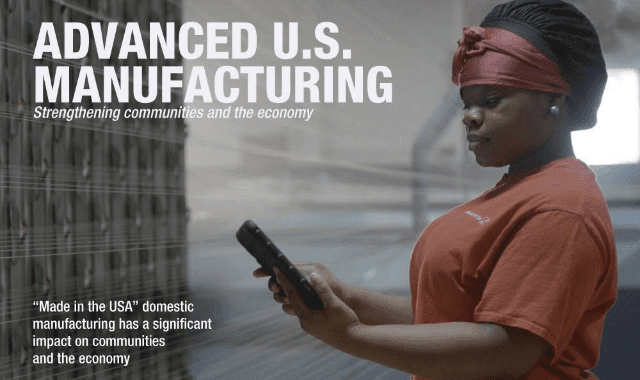 Advanced U.S. Manufacturing #Infographic ~ Visualistan '+g+"
For most Americans, “Made in China” just doesn’t cut it anymore. In fact, 80% of US consumers say they prefer to buy American-made products and 60% say they are willing to pay 10% more for products that are produced in the States. While a large portion of our imported goods still do come from China, the steady growth of advanced US manufacturing is making big moves for the global trade economy. US manufacturing drives more innovation than any other sector. Accounting for almost 10% of the US workforce, manufacturing creates millions of new jobs a year, many of which are open to workers without college degrees or other higher education. Responsible for contributing trillions of dollars into the US economy every year, the sustainability and craftsmanship of American manufactured goods is changing the way we view world trade. Take a look at this infographic brought to you by Standard Textile for more on the state of manufacturing in the US, the impacts it makes on local and global economies, the environment, worker’s rights, and how it gives the United States a competitive edge in world trade.